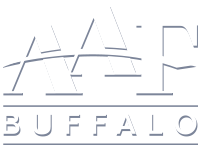 Due to a scheduling conflict we needed to move the date of the WNY American Advertising Awards show earlier than normal. In doing so we felt a rematch of last year’s wrestling-themed show wouldn’t be fair to all of our attendees and entrants with a shortened training schedule, so we turned over the creative reigns to our pals at Gelia. 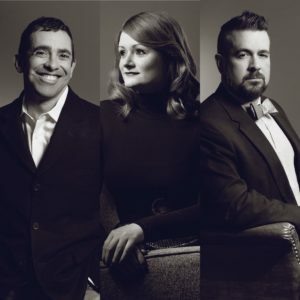 As you may have seen in The Road to the ADDYs series, co-chairs Brittany Klotzbach and Jason Yates have been on a months-long journey to make this The Greatast ADDYs Ever. 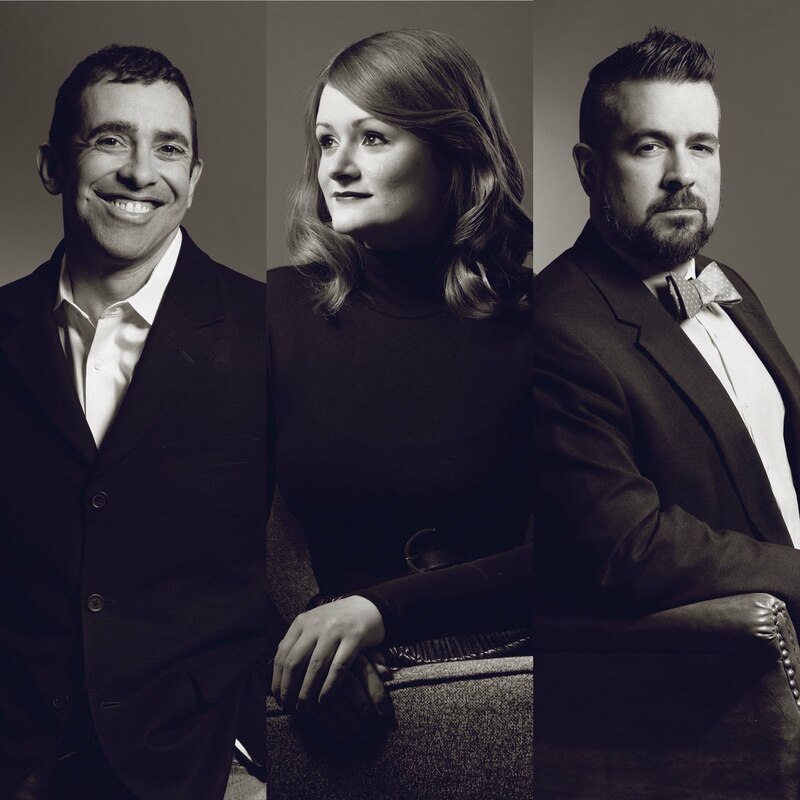 In a nod to Old Hollywood-style award shows, with an appropriately satirical spin on our industry, it’s safe to say the hard work of the entire ADDYs committee allowed the 420 attendees inside Kleinhans Music Hall to properly recognize the greatast advertising our region created in 2017. Judges from Baltimore, Chicago, Pittsburgh, and Washington D.C. scored over 500 professional and student entries in January. Without further ado, see who had an extra great night by bringing home some hardware. 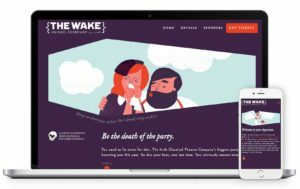 A repeat of last year’s local competition, Crowley Webb brought home the most ADDYs with a total of 35 awards (14 gold, 21 silver). The Martin Group added 22 ADDYs (6 gold, 16 silver) to decorate their new digs on Main Street. Gelia (4 gold, 14 silver) and White Bicycle (3 gold, 8 silver) were the other firms to crack double-digit awards. Rounding out the top five was Telesco Creative Group with nine ADDYs (2 gold, 7 silver). A total of 26 companies took home at least one gold or silver award. 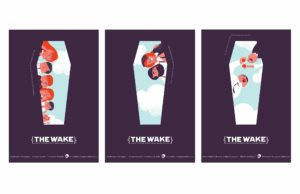 The best of the best on the greatast night in advertising went to Crowley Webb, picking up the Best of Show Award for their campaign for the Irish Classical Theatre Company’s The Wake. Mike Gluck, President at Gluckworks – Levy-Osborn Award for Excellence in Communications – This award was created to recognize outstanding achievement and service in the communications industry. 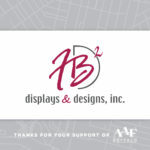 Brittney Sikora, Designer at White Bicycle – AAF Buffalo Future Star Award – This award honors an outstanding young professional in the marketing and advertising field who has demonstrated great potential in their early years in the industry. Matt Low, VP, Creative Director at Crowley Webb – Joe Crowley Award for Service – This award recognizes not only hard work, but also outstanding achievement in furthering the activities and interests of AAF Buffalo. 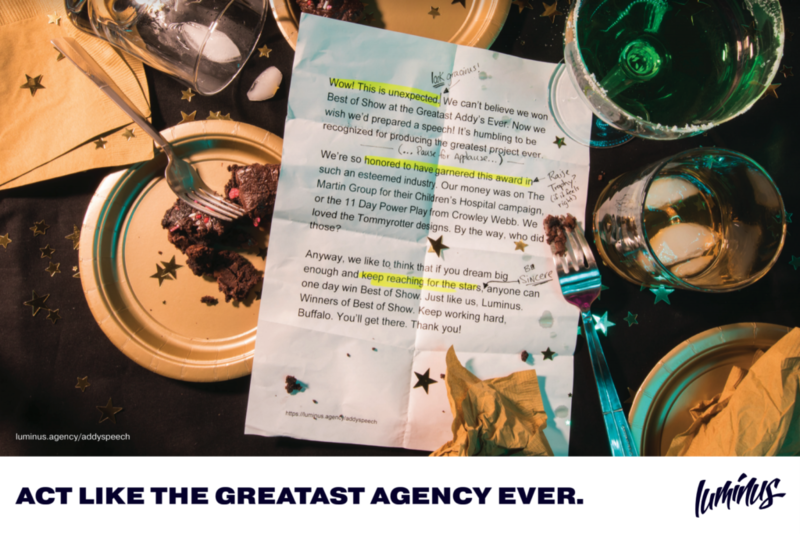 An award designed to make digital natives a little twitchy, the Veritiv Creative Use of Paper went to a new winner this year as Crowley Webb creatively used paper for their 2017 Holiday Card for Praxis. A special thank you goes to Jean Clemens from Veritiv for her continued support of AAF Buffalo and this award. Introduced for the 2018 competition, the CommUNITY Award for Inclusive Advertising recognizes content that extends beyond stereotypical portrayals and depicts multicultural communities and individuals as the complex, multifaceted, and dynamic groups they are. The award recognizes advertising that addresses issues experienced by under-represented communities and gives voice to groups that have been stereotyped or ignored in media and by society, increasing viewer’s perceptions and understanding of multicultural communities. 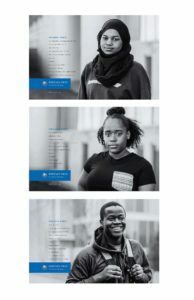 Crowley Webb’s poster campaign for Buffalo Prep earned them the first edition of the CommUNITY Award for Inclusive Advertising. A fun award that acknowledges the best advertisement directed at advertisers went to Luminus who won for their greatast-acceptance-speech-you-didn’t-hear-tonight-themed ad. As mentioned earlier, college students were also included in the action. 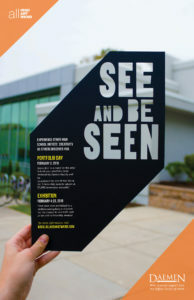 Taking home the Student Best of Show were Noah Herman, Danny Rosina, Randy Oviasogie, Jason Murawski, Danielle Romaneo, Joseph Pietromicca, Jessica Mjoen, Anna Simpson, and Shelby Janczyk of Daemen College for their Daemen All High: See and Be Seen campaign. A total of 20 ADDYs were awarded in the student competition with winners coming from Buffalo State College, Canisius College, Daemen College, St. Bonaventure University, and Villa Maria College. 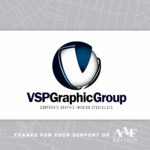 The 2018 WNY American Advertising Award Show would have been less great if it weren’t for the support of our sponsors FB Displays & Designs and VSP Graphic Group. 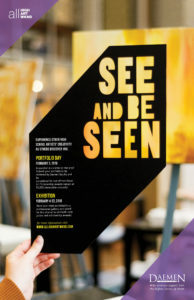 The gold and silver winners in both professional and student categories will have the opportunity to compete in the AAF District 2 American Advertising Awards with the hope of moving on to the national show in Chicago in June. Congratulations to all the winners and another successful year of work in WNY! See all the greatness in the 2018 American Advertising Awards show book below and make sure to view pictures from the night on our Facebook page which will be uploaded in the coming days.